In 2001 /02 Dave Buchanan ex Sunderland and Ronan Liddane were installed as the new management team but early exits from the FA Cup and Vase followed. The same season two players who formerly had £1 million tranfers turned out for Crook. Kevin Scott ex Newcastle centre half and Peter Guthrie a goal keeper who both joined Spurs for the fee. 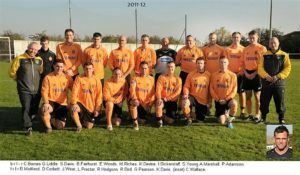 A late season rally ensured survial in Division Two. In 2003-04 Dennis Dolphin started the season as manager, but after nine games in charge he was sacked and Vince Kirkup ex Stanley United boss was installed into the hot seat. There was a night to remember as Bobby Robson sent a Newcastle team to play for the Barcelona Cup, a large crowd watched but Crook were heavily beaten 10- 1. Unfortunately league form did not improve and Kirkup was replaced by Alan Oliver before the season ended. 2005-06 was a memorable season. Aug 10th The Ernest Armstrong Trophy, a pre season tournament was won in front of a good crowd defeating Consett 3-0 in the final. On Aug 27th there was an early FA Cup exit losing 3-0 to St Helens. A nine game unbeaten run including two away wins in the FA Vase Sept 17th 2-1 at Ryton then Oct 1st 4-1 at Spenymoor with ten men and on Oct 29th Winsford were the visitors Milroy and Allen with the killer blows 2-0. Nov 12th saw a shock exit in the County Cup with a 2-1 defeat at Birtley. Midway through the season Crook signed Dean Gordon ex Middlesbrough who had been playing in Cyprus. He made his debut on Nov 19th and scored in a 4-0 win v Billingham Town in the Vase, Paul Stout and Roy Allen 2 finished the scoring. On Dec 10th Ford Sports payed a visit to Millfield in an FA Vase encounter but were safely despatched 8-2. The league championship was a distinct possability at this time and on Jan 21st Vase favourites St. Blazey were sent back to Cornwall with a 3-0 defeat. By Feb 11th Cup fever had hit the town. Eight buses plus cars left the Millfield for a trip to Arnold Town an in an end to end encounter Crook won 1-0 with a Roy Allen goal. While still going strong in the league, Bury Town were next to arrive in the quarter final of the FA Vase. They were now the vase favourites. A crowd of 2500 saw Crook have Bury on the backfoot for most of the game but an injury to Danny Mellanby proved decisive with Bury scoring the only goal of the game and ending Crooks brave run. Too many end of season games ended Crooks promotion hopes but it had been the best season for some time. On the morning of the first game of the 2006-07 season, Alan Oliver was sacked whilst on holiday abroad. The game was played but most of the squad left the following week. Dennis Pinkney once again stepped in to the breach but only nine players turned up for an away game at Penrith. A fifteen year old, Alan Smith (Committee) and Neil Gibson (Kit man) turn out for Crook but a heavy 10-1 defeat ensued. 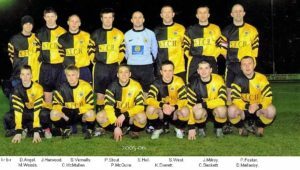 Dennis Pinkney, the club appearance record holder played his 528th game and received his first yellow card in Crook colours. He was fifty years old at the time. Ex Newcastle and Man City professional Steve Howey took charge but he didn’t think he was suited to a Northern League club and soon moved on and was replaced by Ritchie Hill. In 2007/08 the link between Jack Greenwell, a former Crook player who went on to become the first manager of the Catalan giants Barcelona was re established after a visit to the Nou Camp by the then Chairman Steve Buddle. Crook were allowed to design a new away kit in Barcelona colours with the use of the exclusive dye only used for the Catalan giants. It was used first on Sept 15th, a 3-3 draw at Team Northumbria. After only eleven games Ritchie Hill was sacked after early exits from the Fa Cup, Vase and County Cup. Peter Dixon formerly of Leam Rangers takes over and there are nine changes for his first match, a 3-2 home defeat to North Shields. The 2008-09 season started well. On Sept 3rd a 3-0 win in an FA Cup replay against Armthorpe saw Crook progress and a 3-1 win on Sept 10th against Billingham Synthonia saw progression in the Vase. On Sept 13th a 4-3 defeat at Northern Premier League Wakefield saw hopes end in the FA Cup but on Sept 20th a 2-1 win at Barton Old Boys saw Crook progress in the Vase only to go out in the next round. In 2009 -10, with only two defeats in the first eighteen games, saw Crook on the promotion trail for the first time in years. On Nov 14th Backup Borough turn up for an FA Vase tie with nearly the same colour strip. 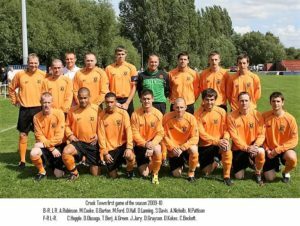 Crook have to play in their play in the away kit but still win 2-0. This was followed up on Nov 20th with a noteable win at the Darlington Arena beating the home side 3-1 in the County Cup. After a good start to the season Peter Dixon decided to leave Crook for West Auckland stating that the budget was not enough to achieve promotion. With most of the players moving with him, Crooks results were poor from there in and the club quickly slid down the league table. Brian Maitland was appointed for the 2010 -11 season which had a steadying influence on team results. 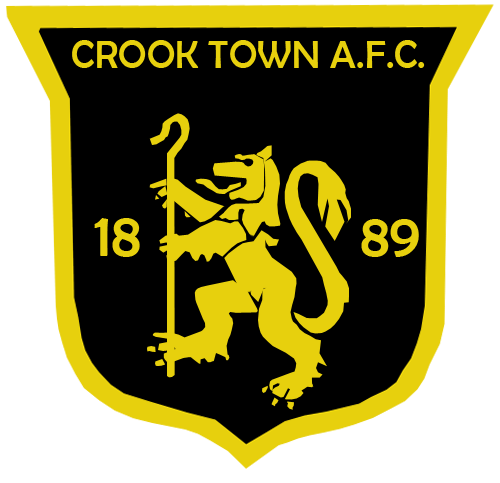 On Aug 14th Crook played away to Silsden in the FA Cup and after a draw won the replay 1-0 and followed that up with a 4-2 win at Team Northumbria in the FA Vase. Sept 18th saw a trip to Bridlington to play Scarbrough Athletic who were ground sharing but an entertaining encounter led to a 3-2 defeat which was to be the highlight of another disappointing season. 2011-12 saw another change in Management. Gary Pearson was appointed as manager but with an indifferent start to the season only a good run of results at the end of the season saw Pearson keep his job. 2013 -14 saw a good start to the season back in the 1st Division with Crook going undefeated in the first five games. On Aug 31st a great FA Cup win was gained at Kendall Town but an unfortunate injury to Chris Pearson resulted in a 4-1 defeat at Brighouse in the next round. Next came Pickering in the FA Vase and a great 6-1 win was achieved with hat tricks by Kyle Davis and Warren Byrne. A good crowd was in attendance for the next round against North Shields with Crook winning a replay 4-3 in extra time. On Oct 30th another good crowd watched the next round at Dunston but the home side took the honours 2-1. On Nov 22nd Crook took part in its first ever Friday night fixture. Shildon were the visitors and another good crowd saw Crook win 4-2. The season ended with a mid table finish which was indeed progress for the club in its first season back in the 1st Division. The 2014- 15 season saw the club in dire straights financially. The management and most of the players left and Crook did not win a game all season and were relegated back to the 2nd division with its lowest ever points total.